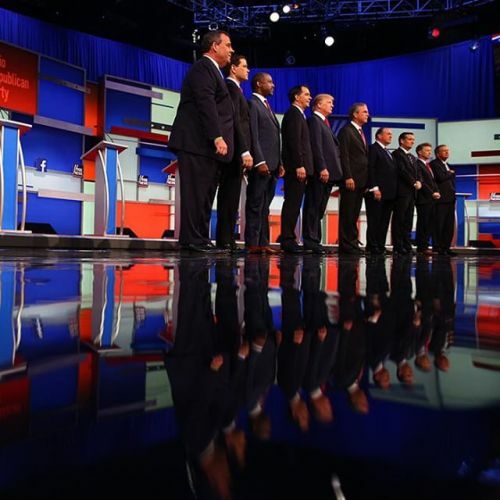 “Candidates in the first #Republican primary debate stood onstage at Quicken Loans Arena in #Cleveland, Ohio. From left to right: @chrischristie, @marcorubiofla, @realbencarson, @scottwalker, @realdonaldtrump, @jebbush, @govmikehuckabee, @sentedcruz, @drrandpaul and @JohnKasich. "It doesn’t feel like a debate that changed the dynamic of the race,” writes the @nytimes reporter Nicholas Confessore. Follow @ericthayer to see more from the #GOPDebate.“ By nytimes on Instagram.